The handheld device uses a single joystick on its handle for the photographer to control the direction the camera will face and the modes the gimbal operates in, while a smartphone app allows the same controls to be applied from a distance of 10m. The app also allows users to program motion-orientated time-lapse sequences with the head turning or tilting by increments to match the shooting settings of the camera. An optional thumb controller is also available that additionally provides start/stop functions for some camera models. Having an app and a thumb controller means that the system can be carried by one person while another controls the direction of the camera. 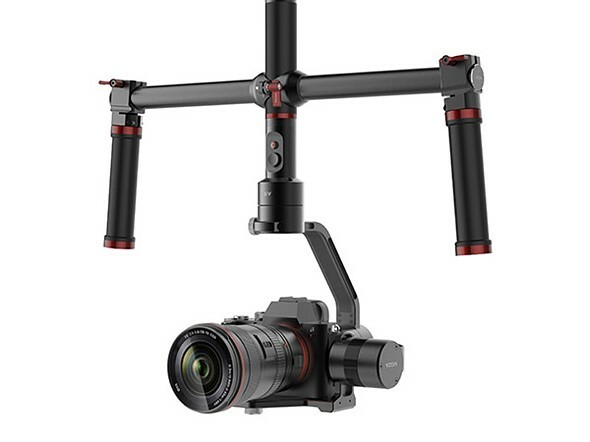 The gimbal is capable of 360-degree rotation in yaw, tilt and roll axes and with a dual-handle included users can opt to have the camera above or slung below the hand grip. The Moza Air is powered by three 2000mAh lithium batteries that run the system for up to four hours. The Gudsen Moza Air costs $599. For more information and to read the full spec of the device visit the Gudsen website.